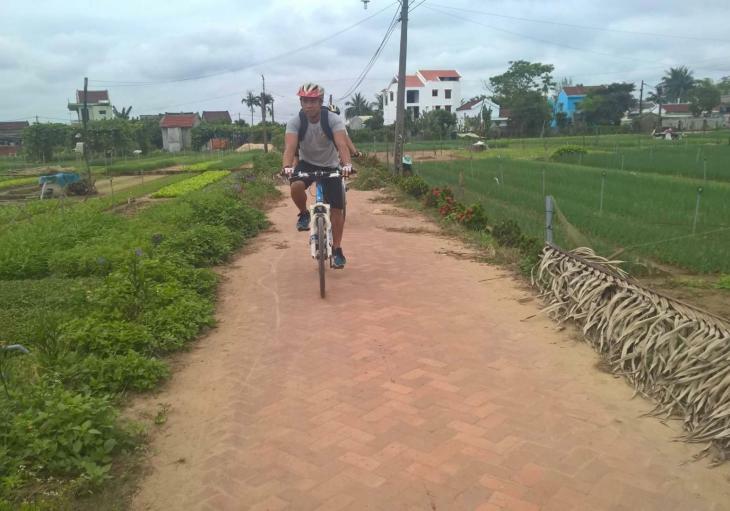 This trip through the countryside trip is a combination of two and half hours of biking through the picturesque countryside and a visit to Tra Que vegetable village. We see how the locals farm, and prepare a meal from the produce that is grown. This is a 6 hour activity that can be done in either the morning or the afternoon. This ride starts right from our office in Hoi An near the old quarter and wanders the streets lined with old shop houses before hitting the river where we board a small boat for a short 10 minute ride over to Cam Kim Island.Once on the island we start biking through small villages and rice paddies on narrow roads and dirt trails. Boat making can be seen right from the trail as many of the local fishing vessels are made here. From here the scenery opens up and the countryside becomes more rustic. 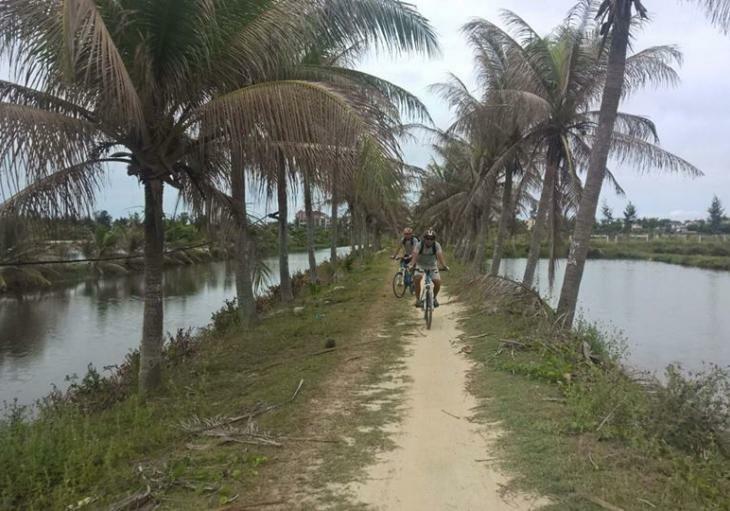 The road remains flat throughout this section of the ride as we pass by duck farms, past old pagodas and enjoy views of farmers out in the field and fisherman in the river casting nets. After 30 minutes or so on the trails we stop for a quick rest and take the opportunity to soak in the silence, and refuel with a couple of snacks. 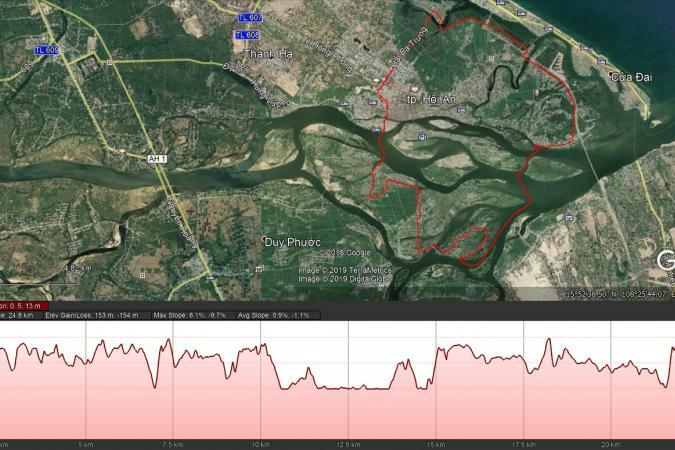 After the break, we catch another boat back over the river towards Cam Thanh village (30 min). Our next stop is Ha Linh lantern factory, where we learn the various steps in producing a traditional Hoi An lantern. We make one of our own as keepsake. The ride continues on a remote countryside road for another 20 minutes or so before turning off on a small section of single track that leads through a grove of palms growing on the side of the river to Tra Que vegetable village. 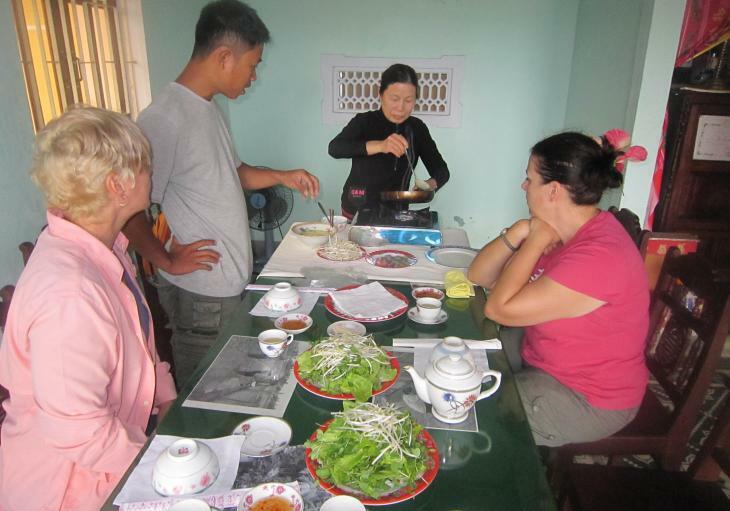 Once arriving at Tra Que Village, we have a chance to learn the traditional farming methods of the locals as well as the cooking class (Banh Xeo) and have a light meal. It is said that the vegetables here are special because the farmers do not use any pesticides or chemical fertilizer at all. We get to prepare a meal with the produce that is grown here. The ride finishes with a pleasant 15 minutes pedal into town on back roads, and we end right where we started, at the PTV office. Hat, sunscreen, repellent, camera, Sandals are not recommended. English speaking guide, all necessary forest and tourist permits, first aid kit, bike, helmet and gloves.